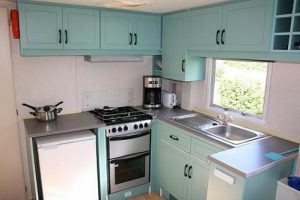 If you don’t have your own camping equipment but you still want to enjoy the beautiful Puy de Dôme in France, then our campsite gives result, we have 6 mobile homes for rent. 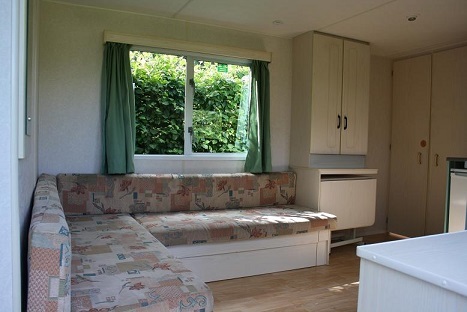 Our mobile homes are spread placed between the pitches and each have their own field. Do your children prefer to sleep in their own tent, that is no problem. It can be set up next to the mobile home (without extra costs). You also have the possibility to rent a camping bed and chair for little childeren in mobile home B. For practical and hygienic reasons pets are not allowed in the mobile homes, also it is forbidden to smoke inside. In short, at arrivel unpack your car and enjoy your vacation ! This mobile home is fully furnished and equipped, for max. 2 adults and 3 children. On arrival the beds are already made up for you. Inside there are two separate bedrooms, one with a 2 pers. bed and one with two 1 pers. beds. and there is an extra bed for children up to 7 years. In the central room is a spacious lounge and fully equipped kitchen with refrigerator, coffee maker, kettle, microwave and 4-burner stove. There is a toilet and seperate shower. To enjoy in the sun there are a picnic table, 2 luxurious chairs and some garden chairs.